Our £1bn destroyer ships are so loud they can be heard 100 miles away. Worth the cost? 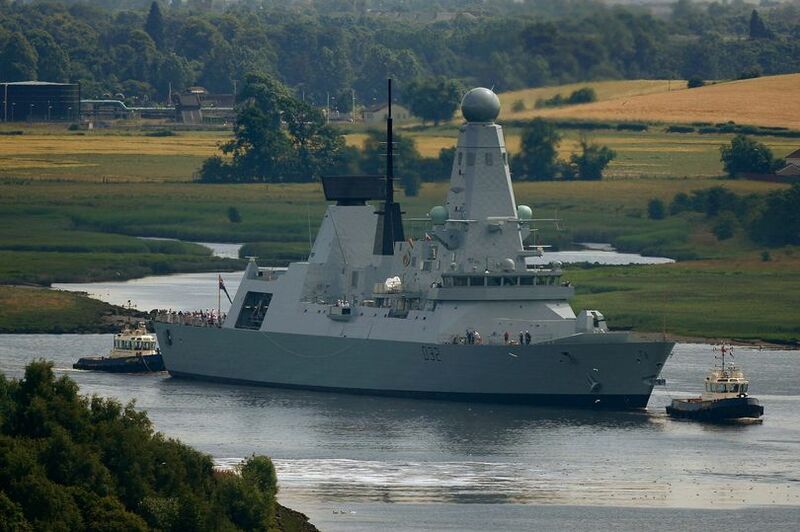 HMS Daring, one of the Royal Navy’s £6bn fleet of Type 45 destroyers [Image: Getty]. The Ministry of Defence says its fleet of £1bn (each) Type 45 destroyers doesn’t have to be quiet as the ships are built to battle air attacks. Great! But if an enemy can hear them coming from 100 miles away, that’s plenty of time to bring up something else instead. It suggests one-dimensional thinking on the part of our military leaders and we need better. These are the same ships – by the way – that needed repairs costing millions because they kept breaking down. The UK is supposed to be the world’s most accomplished naval nation but this latest setback is turning us into a joke. Britain’s defences are so poor that the Royal Navy’s new destroyers sound like a “box of spanners” to Russian attack submarines. Retired Rear Admiral Chris Parry claims our £1 billion pound Type 45 destroyers can even be detected from 100 miles away by Putin’s deadly new hunter killer subs. It highlights growing fears defence chiefs have wrongly concentrated too much investment on the war against terror whilst ignoring the resurgence of Cold War hostilities. We haven’t been the worlds most accomplished naval nation for almost a century, we inevitably do not have the right gear for what we need anymore. We’re the nation that made all the headway. It is our past accomplishments that make us the most accomplished; the others have just followed our example. Barry is right Mike. Britain has not had naval supremacy since the Washington Naval Treaty of the early 1920s. The Second World War showed quite clearly that our warships were no better or no worse than those belonging to other naval powers. The age of British naval supremacy was back in 19th century. I did not mention naval supremacy at all. I was discussing the UK’s position as the world’s most accomplished naval nation. Our accomplishments in that area are incontrovertible, I would have thought. knocking them out sticking out of the water that much. Sounds like a confirm that this really is a crock of poo…..but not to worry it comes out of the taxes….those that actually pay that is. When the Admiral(who thinks Britain has got money to burn) refers to Cold War hostilities, I am assuming that he also is alarmed at the way the US and NATO criminal enterprises are being ratcheted up to encompass more death and destruction. It is extremely worrying the way hard right nut jobs and pseudo lefties within Europe and the US psycho- warmongers are trying so hard to wage war. The only thing that the US has in the way of exports of real worth financially is the war industry and Russia is so much more advanced, that the US is falling behind – hence the need to provoke a war with Russia by any and all means possible. It’s also a good excuse to spend, spend and spend all that spare money Britain has.